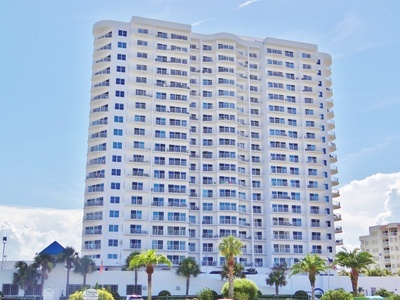 Oceans Grand is a beautiful 21 story high rise condo in Daytona Beach Shores with breathtaking views of the Halifax River and the Atlantic Ocean. Within walking distance to pharmacies, supermarkets, banks, fire and police departments and beach. Consisting of 190 units, floor plans include 2 bedrooms and 3 bedrooms. The 2 bedroom units have a bonus room that can be used for an office or study. 2 pets up to 25 lbs are permitted.